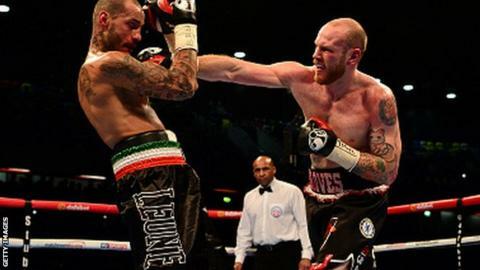 George Groves beat Italian Andrea di Luisa in the fifth round to make a successful return to the ring. Di Luisa's corner threw in the towel at London's Copper Box as Groves dominated in his first outing since September's WBC world title loss to Badou Jack. The super-middleweight, who has a new trainer in Shane McGuigan, now has a record of 22 wins from 25 fights. "I'm going to make a couple of mistakes," said Groves, 27. "I felt really sharp." Groves is trying to rebuild a career that also includes two world title defeats at the hands of fellow Briton Carl Froch.